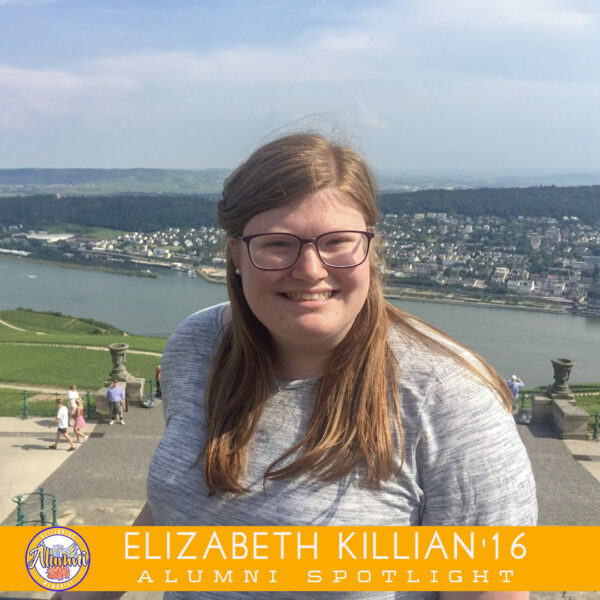 Elizabeth Killian ’16 is a junior in the College of Education at Marquette University. On April 22, 2018, she received the University’s Magis Award, which is given to a student who has exemplified Marquette’s Mission in a significant way. Elizabeth received the award in recognition of her involvement with the Center for Peacemaking, where she worked extensively with the Near West Side Partners and started a student organization, CAMPus Impact. Through CAMPus Impact, Elizabeth has been able to organize events and experiences to get students involved with the communities surrounding Marquette. She has also dedicated herself to Campus Ministry by serving as a Retreat Leader and a facilitator for the Marquette Action Program. Kellenberg has shaped me by showing me the value of faith and how important it is to give back to the community. I would not be as involved with my faith without the guidance from the faculty and staff at Kellenberg. Kellenberg has pushed me to be a well-rounded student, which is a quality I have been able to carry over into my college career. I will never forget a piece of advice that I received in Calculus from Bro. Gary which was something like, “Every decision you make will be the right decision because it will lead you to where you need to be.” This piece of advice has encouraged me to never be afraid to try new things and take on new experiences. How do you manage to dedicate such an incredible amount of time to Campus Ministry and outreach efforts at Marquette while still maintaining a successful academic performance? Adjusting to college was not an easy task, but Kellenberg definitely prepared me to not only put my studies first, but to also prioritize the things that matter most to me, which is service. Time management is definitely something that I have struggled with; however, I have gained the skills throughout my time at Marquette to find the time for the important aspects of my life, especially faith. What inspired you to give back to the communities surrounding Marquette, and what have you learned from this important work? Marquette is a Jesuit University, and throughout my time at Marquette I have been able to learn and understand about many of the Ignatian Values including, Cura Personalis, Men and Women for and with Others, Magis, and AMDG. These values, on top of what I have learned from Kellenberg, along with Milwaukee’s urban population, has pushed me to want to go out into the community. I have learned that there are amazing people that live in the neighborhoods surrounding Marquette, even though it often has a negative reputation among students. My favorite class was Christian Existence my senior year with Mrs. Strauss. I learned so much and we explored so many interesting topics relating to life and philosophy. I also was a part of Stage Crew for four years, in which I had amazing guidance and support by Mrs.Farrell, not only backstage but in my everyday life as well. It was also wonderful to work with Mr. Murphy, and to hear his directions through the headphones backstage. S.A.L.T and S.P.I.C.E. were also two amazing groups that I was a part of at Kellenberg. I learned so many skills and I loved working with Bro. Kenneth, Mr. Brennan, Mr. Kahn, and I will never forget the many times I had to confirm my working schedule with Mrs. Renaghan.